Free Travel Through Credit Cards? Ask this first. It’s no secret that I love to travel. For a little while, though, that wasn’t possible. Our income did not allow room for discretionary spending. As a result, I missed one of my best friend’s weddings, and almost missed out on a chance to say goodbye. Shortly thereafter, I decided to get over my fear of credit cards. I had never had one, as I was strictly of the opinion that if you didn’t have the money in your bank account, you shouldn’t spend it. I’m still of that opinion, but I now use credit card rewards points to get free travel. I pay off my balance in full every statement cycle, so I don’t destroy my credit by doing so. Credit card rewards points played a big role in our ridiculously cheap trip Myrtle Beach last summer. They paid for a hotel room when we attended a funeral. I have been hoarding airline miles in case of another big event or emergency, but may start spending them soon as I have enough for at least two round trip tickets to anywhere in the US, and sometimes points get devalued if the program undergoes an overhaul. As you’re planning your travels for the summer, you may want to get in on free travel with credit card rewards, too. Whether you’re taking a family vacation, going to a friend’s wedding, or trying to travel hack your way to San Diego for #FinCon16, there is some terminology you should understand before you decide to start on your journey. To give you a concrete example, we’ll use two of PenFed Credit Union’s cards to illustrate each point, though you should understand the answer to each question no matter which card you use to travel hack. 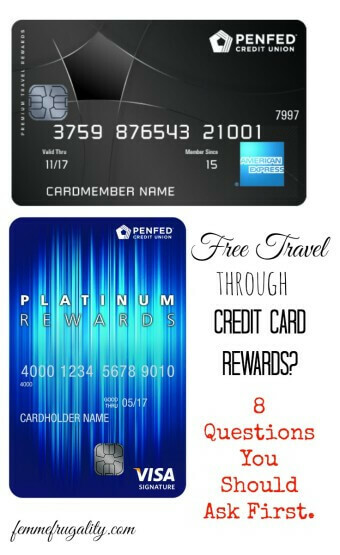 The first card is the PenFed Premium Travel Rewards American Express Card, and the second is the PenFed Platinum Rewards Visa Signature. Can I use a credit card responsibly? This is the most important question. You know yourself better than anyone else. If you can’t resist the temptation of racking up debt, or having credit available to you would create an additional way to indulge your urge to spend funds you don’t have, do not get a credit card. It’s not worth the rewards if it’s messing up your credit score, or putting you into interest-bearing debt. Many cards will promote a 0% interest rate on balance transfers for a period after opening the card. That period may be somewhere between 12-18 months, though it really will depend on the specific card. That means if you have a balance on another card and transfer it to this one, you won’t pay interest as long as you’re making minimum payments. If you miss or are late on a payment, however, interest rates will immediately jump up. You will also want to look at interest rates on new purchases. This is often different than that of balance transfers, or at least a different offer. Some cards will also provide the 0% interest promotion for new purchases, but others will start you right at the standard interest levels. After promotional periods are over, interest rates will jump up. But that’s only a problem for you if you don’t pay your bill in full every month. 0% APR promotional rate on balance transfers for 12 months on transfers made from July 1, 2017 through September 30, 2017. After that, the APR for the unpaid balance and any new balance transfers will be a variable 9.74% to 17.99%. A 3% balance transfer fee applies to each transfer. This transaction is subject to credit approval. What is the balance transfer rate? While interest may be waived on balance transfers for a specific timeframe, there is another fee you should be aware of: balance transfer fees. Every time you make a balance transfer, this fee will apply. Typically, lenders charge either a percentage or minimum dollar amount, whichever is more. Both cards in our example charge 3%, with no minimum dollar amount. That means if you transferred $1,000, you would pay $30. If you’re currently paying interest on the balance, you’re likely to save far more than $30 in interest alone, but always run your own numbers to make sure the math makes sense for your situation. Many rewards cards come with an annual fee, but many of them will waive it for the first year. If you keep your card past one year, though, you will have to pay the fee on your card anniversary every year. Neither the PenFed Premium Travel Rewards American Express Card or Platinum Rewards Visa Signature have an annual fee. It’s not just waived; it doesn’t exist. I haven’t seen a card yet that earns points on balance transfers. All the cards that I have experience with earn points when you make new purchases. How many points you earn is entirely dependent on the card, and often the category of your spending. Some cards will also have a signup bonus where you earn a huge sum of points if you spend $X within so many months. Sometimes this can also include a cash bonus for balance transfers, though not typically points. Expiration dates vary from program to program. Some will expire a certain amount of months after you’ve used them. Others will stay valid indefinitely as long as there has been activity on your account in the past X months. For example, points on both of these PenFed cards expire 5 years after they are earned. What’s available to you will vary greatly from card to card. Some cards are only branded for specific airlines or hotels, while others are a little more liberal in the objects of redemption. PenFed’s points can be used in a variety of ways: on airlines, on products, or for gift cards to a slew of businesses, many of them related to the travel industry. PenFed’s airline points fluctuate in much the same way ticket prices would if you were shopping with cash. For example a flight from NYC to St. Croix for the week of March 25-31 is currently 80,000 points, but if you were flying out of Orlando instead of NYC, it would only be 47,000 points. When you buy, and where you’re flying from, play a critical role in the amount of points you spend. Points can be used on most major airlines. You can also use PenFed credit card reward points to get stuff. For example, you can get a GoPro with a grab bag of mounts for 20,530 points, or an American Tourister Disney Hardside Spinning Luggage for 20,150 points. Another example is sunglasses for your time in the sun. You can currently get a pair of Ray-Bans or Oakleys for 20,200 points. My favorite way to spend my points tends to be on airfare, hotels, or other travel entertainment, but you do have a lot of options available. Once you have your points racked up, all you have left to do is fit your vacation into your schedule for a reduced price, and sometimes even free! Have you ever travel hacked before? Where did you go? This post is in partnership with Pentagon Federal Credit Union. This entry was posted in travel on March 28, 2016 by femmefrugality. The biggest question for us with travel hacking is “what is the minimum spending required?” With fairly low expenses, it can be hard to reach the minimums to earn rewards, so we focus on one card at a time, buy gas station gifts cards, and choose cards that have lower spending requirements. Definitely. We live a low-cost of living city, too, so if our expenses don’t meet the threshhold, it’s not worth it to go over to get “free” points. Great point, Kalie! I’ve travel hacked but regret not doing more of it when I had more freedom to travel. It’s a lot tougher when you have little ones right? I didn’t care about the interest rate though because I refuse to carry a balance…well maybe if there is a 0% promotion…I’ll make sure to pay it off at the end of that period. I’ve used my points mainly for free hotel stays. OH MY GOSH ME, TOO! So much harder with little ones, not only because it can be a logistical nightmare and you’ll come home needing a vacation from your vacation, but also because you have to get tickets and accommodations for 3+ people instead of just 1. I’m not typically too interested in the interest rates for the same reason, but it is good to be aware, even if you never have to pay them. Always! I like it too, when we can use credit card miles for a flight, but then still get the airline miles with that airline. Do you do that by purchasing through a rewards points system rather than frequent flier miles? Just a shout out for the less-well-publicized travel card I use: the Bank of America Travel Rewards card. It’s BofA, so I don’t think it gets as much press as Chase, etc., but if you have another BofA account you get an extra 10% points! I use BofA for checking, so my total rewards is 1.65%, and there’s no fee. Sign on bonus was great when I started, not sure about now. I love it! I’m a big fan of credit card rewards, but they are fraught with risk and, honestly, some moral questions, too. Future post on that latter bit. Still, the rewards are too great for our household to pass up. These cards undoubtedly increase our spending, too, but not to the degree that they’re a net loss. We’ve paid for 2 trips to South America, 2 to Europe, Africa and Asia later this year…all at least primarily funded w/points. Can’t wait to read it! Your travel posts were a contributing factor to my final decision to make the plunge. I could answer positively to all of these questions, though, so that was when I made my ultimate decision. Thanks for all the straight talk then and now! I’ve never gotten into the travel credit card thing. I currently use my rewards for student loan rebates… maybe once I’ve got those loans all paid off, I’ll look into it!? I would love, love, love to travel more. This might just be the way I can do it on my not so high salary. That’s awesome, too! Both definitely continue to upping quality of life. One note, salary does affect your credit limit, but as it grows, and the longer I’ve stayed with the same account, I’ve seen it increase with little effort. And absolutely! You have to ask the responsible questions before opening any type of mine of credit just because it could give you some luxuries. I actually just applied for a new rewards card to try to put a big dent in an airline ticket to Hawaii. It had a $4,000 spend in 3 months though, which is going to be difficult for me to hit. I usually come it at around $1,000 a month. I’m actually planning on stocking up on gift cards towards the end or trying to put some of my non-hackable trip expenses on it to reach the amount and do some early Christmas shopping.